Her mother a jackal and her father an insurance agent, Barbra Streisand has coveted the fabled Triangles of Zinthar since she was a mere six years old, determined to use them to assemble the Diamond of Pantheos and become the mighty mechanical kaiju known as Mecha-Streisand. Her enormous nose and horrific singing soon attracted the attention of film critic Leonard Maltin, who saw to it the Triangles were divided at opposite ends of the world. 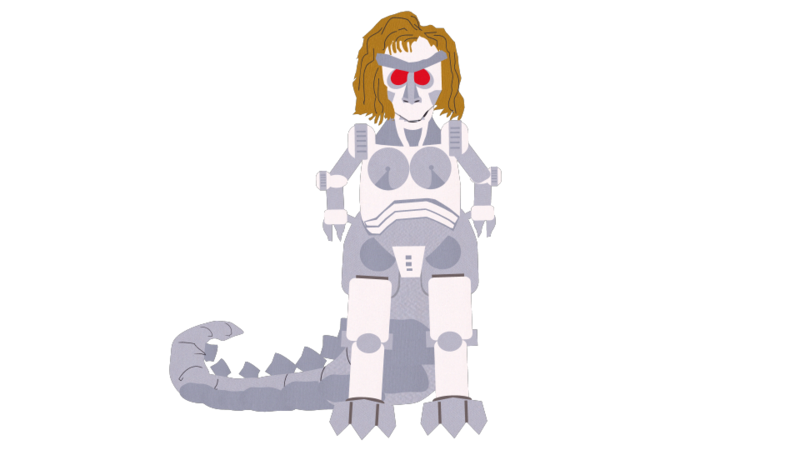 Mecha-Streisand herself, the dangerous monster, resembles a giant mechanical dinosaur, usually keeping the Diamond of Pantheos sealed within her famous nose. Her second form is equipped with a chainsaw hand, a fire beam from her mouth, and toxic stink spray, in addition to using her enormous size as a weapon. Her greatest weaknesses have been shown as her nose, and singing duets with singer Neil Diamond. When an archaeological dig resulted in Eric Cartman and Kyle Broflovski discovering the final triangle, she visited the town to retrieve it, eventually taking them hostage. After a devastating rampage across town, she was finally defeated with the help of the boys, Chef, Maltin, Sidney Poitier and Robert Smith, and she was blown apart, and the triangles again separated. Her hatred for the town of South Park only grew. The incident, and the woman herself, have remained infamous. Her remains were eventually collected and rebuilt by Tom Cruise and Rob Reiner, who sought to attract her involvement in their class-action lawsuit against the town. After relocating the Diamond of Pantheos, Mel Gibson used it to reactivate her and release her upon the town. Her appetite for destruction had only grown, and she destroyed Casa Bonita and even killed a brave Pip Pirrup as he boldly stood up to the four-hundred foot robot. It was only when the Super Best Friends arrived that she was defeated for now. Her current whereabouts are unknown, but rumor is she recently chose Gerald Broflovski to be her lawyer. Her human form was prominently used in her first appearance, but since then she has only been seen in either of her mechanical forms. Barbra Streisand was long considered one of the most notorious and derided celebrities in South Park's history, although many of these jokes are only in the first five seasons. Since the fifth season, Streisand has only been referenced in her capacity as a giant mechanical creature. On Facebook, Gerald Broflovski posts a status about one of his new clients being a four-hundred foot tall giant robot. At least one local resident isn't quite sure who it is, though. Various elements of her design are inspired by various Godzilla films, primarily the oldest and newest films. The original version of Mecha-Streisand is a homage to, and resembles, MechaGodzilla in the 1974 film Godzilla vs. MechaGodzilla and it's direct sequel, the 1975 film The Terror of MechaGodzilla. The MS-2010 build seen it later episodes mixes elements of the third version of MechaGodzilla, Kiryu, from the 2002 film Godzilla Against MechaGodzilla, it's sequel Godzilla: Tokyo S. O. S. and the updated version of Gigan from the 2004 film Godzilla: Final Wars. Her toxic stink spray may be a homage to the monster Hedorah from the 1971 film Godzilla vs. Hedorah.